Mosaic is one of the oldest and most enduring art forms. These tiles are cut from colored stained glass that will last nearly forever, their rich colors never fading. 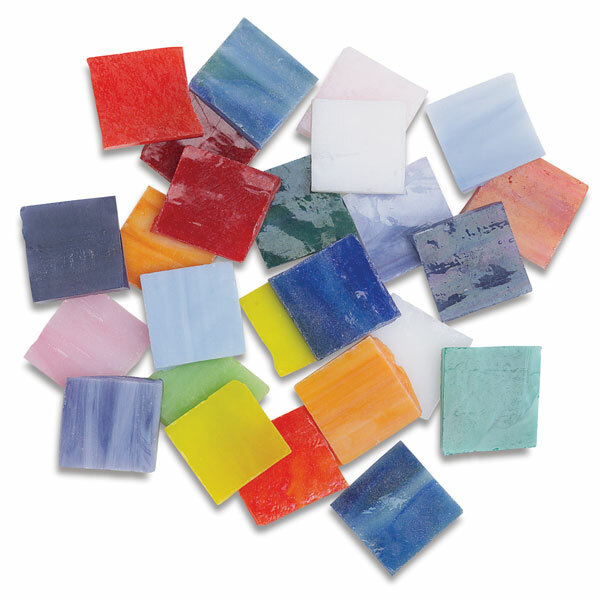 The Mosaic Glass Chip Assortment is sold in 4 lb (1.8 kg) packages, which contain approximately 600 opaque glass chips in assorted colors. Each tile measures approximately 3/4" (18 mm) square by 1/8" (3 mm) thick. Tiles are easy to cut, nip, chip, and apply. Due to the marbleizing of this glass, color may vary in each package. Mosaic Stone Indoor Cement — No mess, no hassle, just beautiful results. Mosaic Stone Indoor Cement is specially designed for use with mosaic glass projects. It's extremely strong (rubber cement will crack in shallow mosaic forms), and dries within one hour to a smooth, white finish. Mosaic Stone Outdoor Cement — The super strong formula stands up to the harshest of weather. Mosaic Stone Outdoor Cement with crack reduction results in a smooth, porcelain white finish for long-lasting projects. This improved formula has superb pigmenting quality and requires no sealant! New formula requires longer drying times.